Sunday Creek is available from Amazon. Jeff Streeby, you have done what no poet has done in cowboy poetry. Sunday Creek is a masterpiece. I notice right out of the chute that this is a collection of significant work, a voice long overdue, one that will ring long and true and be received with great enthusiasm from those with the keenest western sensibilities. I've been tempted, at times, to claim that Jeff Streeby's Sunday Creek transcends the label "cowboy poetry." Outside the cowboy poetry community, awareness of the genre is limited -- and Streeby's collection is so strong and so compelling that I want to say it's more than just good cowboy poetry, it's good poetry, period. But to claim that Sunday Creek is too good to be genre poetry is to do a disservice to the book and to its readers, not to mention to the genre. Yes, Streeby's collection is cowboy poetry, and if that's not a genre you read yet, it should be. Within these pages you'll find a dazzling array of narrative voices, the entire population of the town of Sunday Creek speaking from beyond the grave. Here are ranchers and rustlers, judges and prostitutes, Native Americans and Irish immigrants. Here are women and men, young and old, those who love the West and those who didn't intend to stay. To speak for every member of a dead town -- to span generations, communities, life-experiences -- and to do so genuinely is a tall order, but it's one Streeby's more than able to fill. Streeby manages to convey dozens of different voices, each distinctive and unique; each poem stands both apart from, and connected with, its brothers. These poems are funny, poignant, and sad. Streeby grounds the book's voices in historical details -- and somehow manages to make every poem ring true. If this is your first encounter with cowboy poetry, with Jeff Streeby, or with Sunday Creek, you're in for a treat-and if you've been here before and are returning for a second or third or tenth reading, welcome back. Sunday Creek's been waiting for you. Jeff Streeby is definitely one of the best writers out there today. His style and imagery are unique and individual. It's truly amazing how he assumes the persona of a fictitious character of long ago and creates a literary personality, a voice, a human quality and descriptive experience that all take on a sense of reality, thereby giving the reader a deeper understanding of history. He is one of a kind. I've read it all, and I love it! What an undertaking. His characters are so well drawn, and the threads that connect them to each other make it feel something like a novel. I can't wait to see the rest of it. plain old cowboys that know which end of a horse to put the hay in. Jeff is the first man I've ever encountered that is equally comfortable in all of these circles. A man of letters, and a man of latigos. I once asked him how an educated scholar with his command of the English language could justify using the word "smushed" in one of his poems. His answer: "I'm bilingual. I speak both English and cowboy." back into their world and feeling their pain. To label Sunday Creek as cowboy poetry, really might be too limiting. In my opinion, it transcends the genre and takes it to an entirely new level. Sometimes, if a poet gets lucky, he can crank out a couple of remarkable poems over the years. Jeff Streeby seems to be the exception. The pages of Sunday Creek contain more notable poems than any one writer has a right to. The remarkable poems are surrounded and supported by others nearly as noteworthy. The differences are slight, and readers will disagree which selections deserve the higher praise. Being something of a Western history buff, I am impressed with the scope of Jeff's coverage -- the inclusion of representatives from all walks of life, the depiction of prototypical frontier events from multiple viewpoints, the subtle passage of time and the change it triggers. But this is poetry. So, despite the success of all that other stuff, if the poems ain't poetic then any claim of success for Sunday Creek would be misplaced. Here's where Jeff really shines. His use of words and language is fascinating. He utilizes period lingo effectively and believably. Literary allusions are brought to bear powerfully. Mundane events intrigue with lyrical presentation, while incredible happenings sneak up on you with subtle words then shock you into a realization of what you have read. Sunday Creek is an amazing piece of work, even in this interim form, and will be enjoyed by all who admire what words can accomplish when properly wrangled. My only gripe about it is that it's a damn shame I'll never write anything this good. Sunday Creek is a major work, not only for cowboy poetry but for American poetry in general. The imagery is wonderful, with vivid recreations of a vast spectrum of Western types. It represents the best in Cowboy Poetry, with solid historical scholarship wrapped in captivating verse.. Many people write about the past. Jeff Streeby understands it. His interpretations of the lives of those whose character, strength and determination settled the West stand head and shoulders above anything ever written before. The research and structure behind each piece reinforces the sacrifices made by those persons on which his characters are based. Sunday Creek-- a mythical place? I think not. It is every pioneer's story. It is every Westerner's history. And it should be every American's pride that the West was built by such people as those who inhabited Sunday Creek. Jeff Streeby-- just a writer? No. He is a Storyteller in the finest sense of the word and the Spirits of the West speak to him. How very fortunate for us that he chooses to share what they say. In all my years of reading about, and living the Western lifestyle, I have never come across a writer who is so in tune with Western History as Jeff Streeby. In the years when we were partners and lived relatively close together, I realized that he was an excellent Cowboy Poet and a prolific writer, but I don't think I realized the depth of his ability. I suppose I took those abilities for granted. Now, I look at Sunday Creek, his newest work-in-progress, and I see stories that parallel actual historical figures and events. All of these exist within the correct time frame. It's as if a person were entering history from a different doorway, encountering these figures and events, being and happening, slightly differently than history dictates. In many cases, the lives and events portrayed are enriched by Jeff's versions. It is a great collection of Western Writings. I feel that Jeff is far and away the best writer of both historical and fictional Western Literature in the world today. Jeff writes in contemporary, classic, and just plain down-to-earth fashion. Words common to the time, expressions, the way his characters speak, rationale of the time period, knowledge of horses and a way of life-- all these come together to allow the reader to readily enter a time gone by. It is easy for the reader to sit back in a quiet spot and allow themselves the luxury of drifting back to another time to smell the smoke, to hear the battles, to feel the pain and exhilaration that accompany each of his stories. I highly recommend any of Jeff's writings to anyone who has an interest in the Old West. 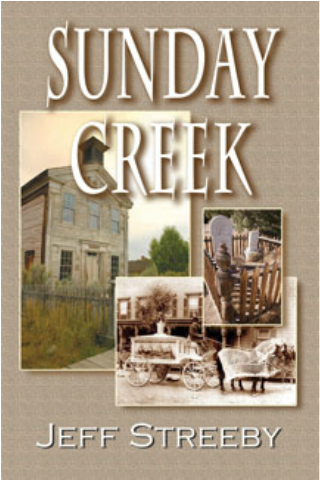 Jeff Streeby masterfully creates the world of Sunday Creek, a place vividly populated by Native Americans, mountain men, miners, highwaymen, homesteaders, cowboys, slatterns and orators -- saints and sinners from all walks of life. As in Edgar Lee Master's classic Spoon River Anthology, the story of the place unfolds through epitaphs spoken in verse by the town's residents. But this provocative work is an original, a daring work in form and substance. From the gritty days of settlement and for another hundred and fifty years, these tales -- many inspired by actual events and real people -- reveal the interwoven relationships among the townspeople and a community emerges, reflective of the complex histories of those who populated the American West. With Streeby's careful scholarship and skillful storytelling, the chorus of voices sings with authenticity and the reader becomes a traveler to a place not soon forgotten.